Vonnie Jonas was born on November 14, 1930 in Alton, Iowa to Joseph and Viola Konz Tastove. The family later moved to a farm near Adrian, MN where Vonnie graduated from St. Adrian High School in 1948. She then attended Stewarts School of Cosmetology in Sioux Falls, SD graduating in 1950. On February 16, 1950 she and Gerald Jonas were married at St. Adrian Church in Adrian. Following their marriage they farmed south of Adrian and raised their 13 children. In 1979 they retired and moved to Adrian. Gerald passed away on June 17, 1988. Vonnie remained in Adrian until 2010 when she moved to Ecumen Meadows in Worthington, MN. 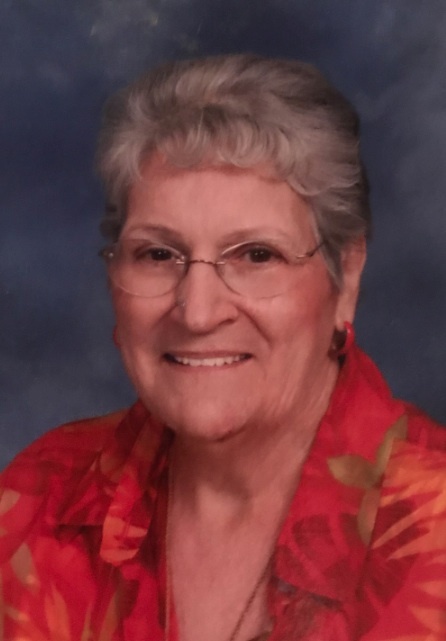 In September 2017 Vonnie moved to Crossroads Care Center in Worthington where she passed away on Wednesday, May 30, 2018 at the age of 87. She was a member of St. Adrian Church and was a member of the Catholic Daughters of America and the CCW. Vonnie enjoyed spending time with her family, crocheting, quilting, traveling and ceramics. Survivors include her 11 children and their spouses, Richard and Marcia Jonas of Adrian, MN, Sheryl and Richard Dahlke of Farmington, MN, Glenda and Dennis Hale of Savage, MN, Gary Jonas of Casper, WY, Steven Jonas of Worthington, MN, Darrell and Sheila Jonas of Garretson, SD, Karen and Lonny Sturges of Sioux Falls, SD, Mark Jonas of Garretson, SD, Myron and Katy Jonas of Apple Valley, MN, Audrey Boltjes of Worthington, MN, and Jennifer and Dean Luettel of Adrian, MN, 20 grandchildren and 24 great-grandchildren. She is preceded in death by her parents, husband, Gerald, two daughters, Patricia and Kathleen Jonas, infant great-grandson Rhett Boltjes and an infant brother, Joseph Tastove. St. Adrian Church in Adrian, MN on Monday, June 4 2018 at 10:30 a.m. with Monsignor Rick Colletti officiating. The organist is Karen Cook. The song leader is Marcia Jonas. The pallbearers are her grandchildren. Interment is at St. Adrian Cemetery in Adrian, MN. Visitation will be at St. Adrian Church on Sunday, June 3, 2018 from 4-6 p.m. and also one hour prior to the services at the church on Monday.